We’ve gotten a lot of wonderful apples in our CSA (Community Supported Agriculture) box the past month or so and no one was eating them. 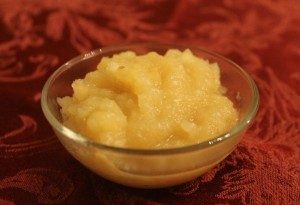 I’ve never made applesauce before and was surprised at how easy it was – and how delicious! 1 Put all ingredients into a large enamel or stainless steel pot. Cover. Bring to boil. Lower heat and simmer for 20-30 minutes. 2 Remove from heat. Remove cinnamon sticks and lemon peels. Mash with potato masher. That’s it! You can serve it either hot or cold. Enjoy!